We value the important role you play in promoting and selling our One Happy Island and thank you for your ongoing support. This recently refreshed website has been tailored to help you quickly find answers to questions you or your clients may have, and to provide you with easy access to general information on all aspects of our island; the educational and promotional programs we offer, our calendar of events, updates on our island’s hotels, activities and restaurants and much more. We encourage you to use the Quick Links on this page to quickly find answers to the most often searched topics on this site. And we invite you to refresh your knowledge of what makes Aruba the most re-visited Caribbean destination by clicking on Aruba’s key selling points – which can be found at the tab above. 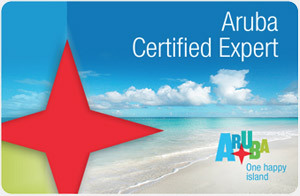 Aruba is an ever-evolving premier destination that continues to offer some of the highest quality tourism products and services in the Caribbean with an emphasis on providing memorable vacation experiences for your clients while following a path of sustainable development. Again thank you for your support … we look forward to sharing our One Happy Island with you and your clients. Click this link for our travel agent offers.